Date of publication of the official Valid Standard : 25.03.2003. Utilization : Small guardian and companion dog. FCI-Classification : Group 9 Companions and Toy Dogs. Section 3 Small Belgian Dogs. Brief historical summary : The three breeds (Griffon Bruxellois, Griffon Belge and Petit Brabançon) all descend from a small rough-coated dog called a “Smousje”, which for centuries has been found in the Brussels area. In the 19th century, bringing in blood-lines from the Ruby King Charles Spaniel and the Pug produced the short black coat and fixed the current breed type. These little dogs are very alert and were bred to guard carriages and keep stables free from rodents. In 1883 the first Griffon Bruxellois were registered at L.O.S.H. (The St.Hubert stud book). They were Topsy (L.O.S.H. nr.163) and Foxine (L.O.S.H. nr.164). By about 1900 they had become very popular, together with other breeds, thanks to the royal interest shown in them by Queen Marie-Henriette of Belgium. Many specimens were exported abroad and helped the spread and popularity of the breed. General appearance : Small companion dog; intelligent, wellbalanced, alert, proud, robust, practically square; with good bone but at the same time elegant in its movement and construction; attracting attention by its almost human expression. The two Griffons are rough-coated and are distinguished to each other by colour, whereas the Petit Brabançon is short-coated. Muzzle : The foreface including the nose is very short : it must not exceed 1.5 cm. For the Petit Brabançon a correct foreface appears longer because it has no furnishing. A poor expression is given by a nonturned-up foreface, just as it is by a nose whose top line lies below the line from the bottom of the eyes and these are both serious faults. Lips : Black. The top and bottom lips are in close contact and closefitting. The upper lip does not form flews and does not overlap the lower lip. If it is too loose it spoils the desired expression. Jaws/teeth : The lower jaw is curved upwards, broad, non-pointed and jutting beyond the upper jaw; the breed is undershot. The incisors on each jaw are expected to be regularly set and in a straight line, with upper and lower remaining really parallel. The mouth must be tightly closed, showing neither teeth nor tongue. The width and prominence of the chin are extremely important. Care must be taken to ensure that no incisors are missing. General appearance : Front legs parallel with good bone, set sufficiently wide apart. General appearance : Hind legs with good bone, really parallel, angulated to balance with front legs. Gait / Movement : Powerful, parallel movement of limbs with good rear drive. High-stepping front movement and ambling are faults. 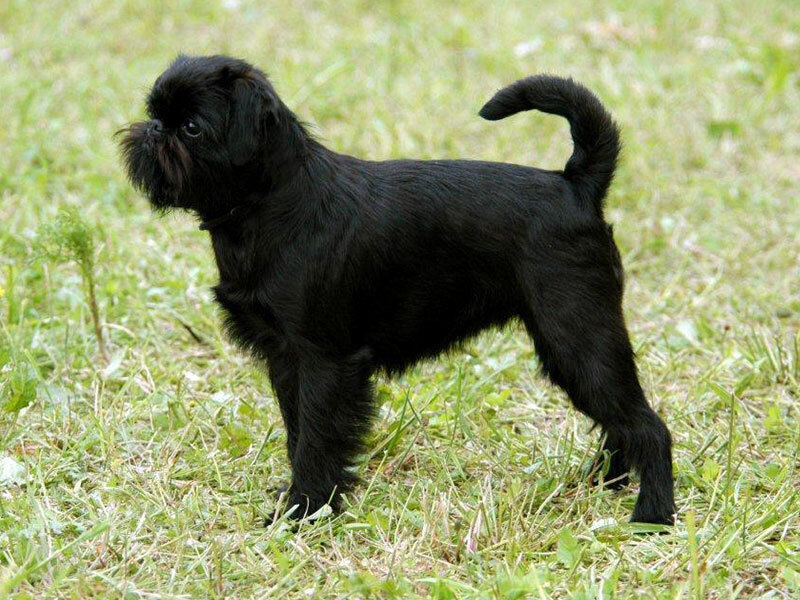 Quality of coat : The Griffon Bruxellois and the Griffon Belge are roughcoated with undercoat. The hair is naturally harsh, slightly wavy, not curly, it is trimmed. The hair must be long enough for its structure to be appreciated. Hair which is too long destroys the outline and is not sought after. A silky or woolly coat is a serious fault. The Petit Brabançon is short-coated. The hair is harsh, flat and gleaming, and at most 2 cm long.